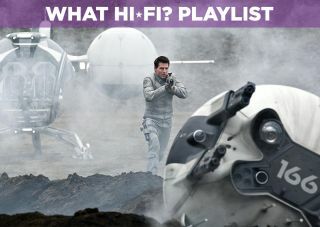 Oblivion Blu-ray review | What Hi-Fi? A little guy potters about on an abandoned Earth. It’s not WALL-E: it’s Tom Cruise, left behind after the planet got beaten up by aliens. But did that really happen? As he starts asking questions, he’s led on a studio tour of sci-fi tributes. There are some seriously creepy robots, possibly descendants of R2-D2 and Robocop’s ED-209. Elsewhere, a canyon dogfight is lifted from Star Wars. The threat of The Terminator. The eeriness from Alien. 2001. Total Recall. Moon. This film borrows heavily. It’s also unashamedly cliché, with Cruise’s antics best described as one last amnesiac conspiracy. But that doesn’t stop Oblivion from being impressive and really rather enjoyable. This cocktail is heady enough – we don’t mind if it tastes a little familiar. This is a considered blend of sci-fi that doesn’t feel the need for constant explosions. It’s hard not to smile as Cruise collects scraps of civilisation in the shadow of derelict landmarks. Moments like these really help to build a sense of isolation, making all the more effective those times when it comes to making some noise. And then Oblivion really doesn’t hesitate. Action sequences are nicely varied, alternating between eerie on-foot missions and aerial acrobatics with a very cool plane. They’re also carefully paced, punctuating quiet passages with short blasts of mayhem. Less is definitely more in this case, and Oblivion can be genuinely thrilling. The film may be lacking in originality, but it’s refreshingly competent. We’ll gladly take a bit of ‘derivative’ over another smash-fest that subjects you to 20 straight minutes of camera shake. And if you’re looking for a new test disc, you’ve just found it: Oblivion is a sensory delight. The bleak, post-apocalyptic planet allows for some gorgeous cinematography. Long, sweeping shots of valleys and ruins offer plenty of opportunities to test your system’s detail resolution and motion handling. The soundtrack is even more impressive. Sound effects are stunning in DTS-HD Master Audio 7.1, especially when it’s a futuristic jet in a nuclear thunderstorm. Elsewhere, there’s an effective bit of electronica from M83, clearly inspired by Daft Punk’s brilliant score from Tron: Legacy. Admittedly, there’s not a single thing here that you’ve not seen before. But Oblivion is a solid slice of premium sci-fi, and those are hard to come by. This is one of the best discs we’ve seen this year. Get it now.